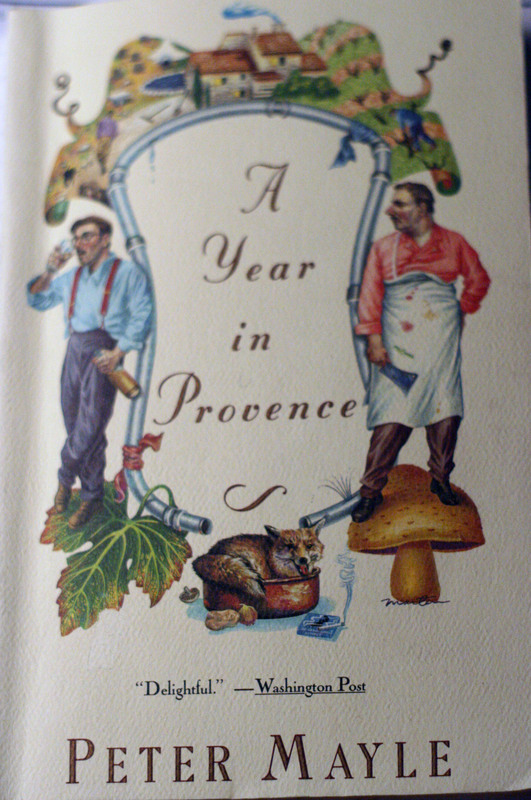 When I read the first sentence of A Year in Provence by Peter Mayle, I knew I would love the rest of the book: "The year began with lunch." What better way for a book about food, Provence, and life in general to begin! If you love food and travel and have never read Peter Mayle, I suggest you begin! His first book, A Year in Provence, is my favorite. It chronicles a year in his life as he and his wife settle as foreigners into a house in the depths of the Provencal region of France. "...when we heard that over in the village of Lacoste, a few miles away, the proprietor of Le Simiane was offering a six-course lunch with pink champagne to his amiable clientele, it seemed like a much more cheerful way to start the next twelve months. By 12:30 the little stone-walled restaurant was full. There were some serious stomachs to be seen -- entire families with the embonpoint that comes from spending two or three diligent hours every day at the table, eyes down and conversation postponed in the observance of France's favorite ritual. The proprietor of the restaurant, a man who had somehow perfected the art of hovering despite his size...quivered with enthusiasm as he rhapsodized over the menu: foie gras, lobster mousse, beef en croute, salads dressed in virgin oil, hand-picked cheeses, desserts of a miraculous lightness, digestifs. It was a gastronomic aria which he performed at each table, kissing the tips of his fingers so often that he must have blistered his lips." A Year in Provence is not a recipe book, it's a food memoir. Needing a recipe for this post, I began looking for something quintessential Provence. And then I realized what the 6th of January is: La Fete des Rois or "The Celebration of the Kings" (i.e. Epiphany). In Provence, and all of France, a special dessert called a "King's Cake" will be made (or bought) and served throughout the land in honor of the kings who visited Christ after his birth. It seemed most appropriate. I had my doubts about how this would taste, having never seen, nor heard, about this cake before. I was pleasantly surprised, along with the others at my table. 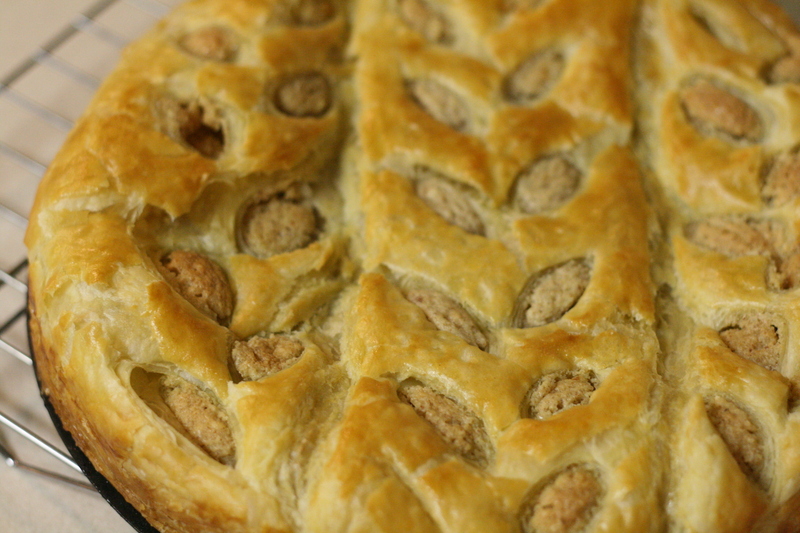 The feathery light pastry combined with the just-sweet-enough, soft almond filling makes for an amazing dessert. We all loved it and I already have plans to make it again before the month is out. Make the frangipane: cream the butter and sugar. Mix in the almond flour and almond extract. Add the eggs one at a time, to gradually incorporate them. Fold in the flour. 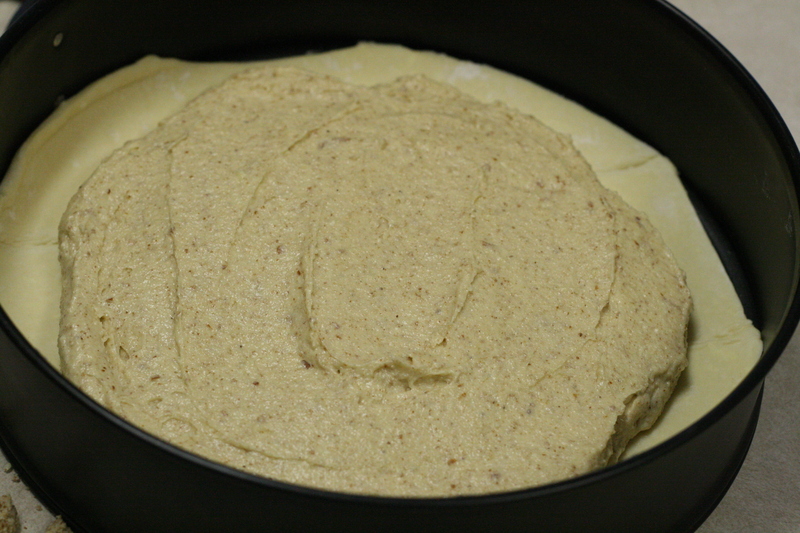 Cut a second circle of pastry. Using a knife, cut a design in the top, or at least make vent holes. 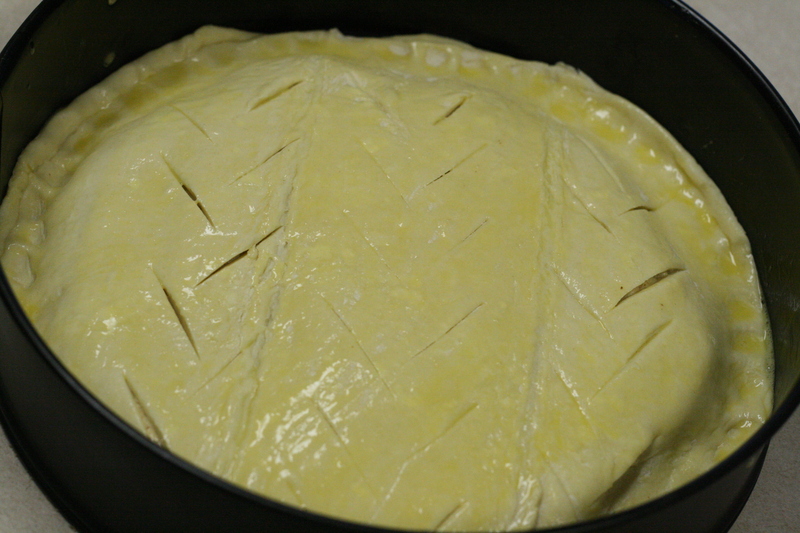 Place the pastry over the frangipane and press edges to seal. Brush the cake with egg. Bake at 350 for 30 minutes (mine took about 42 minutes) until the pastry is golden. Allow to cool. I LOVE that book. I laughed and laughed and laughed. Such a delightful read and the cake looks fabulous! I loved that book, too. I read it during a time I needed to laugh but I had been burned by modern authors. I bought Mayle's books at a library sale very cheap just because they sounded good. That looks really good! I will have to try that! Joel and I LOVE King's Cake. This year it was his request for his birthday cake... which just happens to fall on Epiphany. 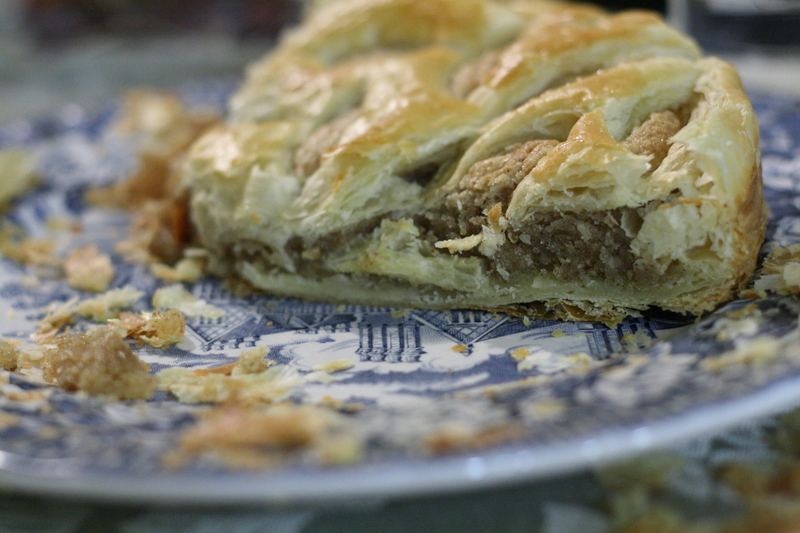 Our version of the cake has chocolate in the filling and I used a whole almond in the place of the hidden bean.